Explaining the mysteries of science, in simple language. Dirty snowballs, snowy dirtballs and the leftovers of solar system formation. These names are commonly used to describe the often visually stunning ice extravaganzas that streak across our skies from time to time - comets. These somewhat simplistic names mask the importance of comets as repositories for material from which the planets formed. Comets contain volatile chemicals - materials that vapourize at relatively low temperatures, such as water, carbon dioxide, ammonia, and methane. This means comets have very limited lifetimes - they get vapourized and lose a lot of their mass each time they pass close to the Sun - so we know that each one we see is relatively new to the inner solar system, giving astronomers a window through which to observe the elemental and isotopic evolution of the early solar system. The Sun emits light across much of the spectrum, from the blues, greens and reds we can see down into the infrared and up into the ultraviolet. When that light reaches an object, like a comet, some wavelengths of light get absorbed while others are reflected, depending on which materials are present. Similarly, certain molecular interactions also emit light but only at certain wavelengths. This leads to the creation of “spectral lines”. However, even the Sun’s spectrum contains thousands of absorption lines, known as the Frauenhofer lines. Current methods for determining the composition of a comet from the relative comfort of the Earth rely on the analysis of these spectral lines, but this approach is hampered in a number of ways. Firstly, there is the problem of the sheer number of spectral lines detected, and the superposition of these lines in relation to one another. Identifying the distribution of one molecule amongst the thousands of lines that can be detected in one observation is a complex and difficult process. This can also limit the detection of rarer chemicals as they can be masked by more prevalent compounds. Interference from the Earth's atmosphere is also an issue when ground based telescopes are used. The atmosphere can absorb photons at a number of different wavelengths, so some lines of certain species (molecular oxygen and water for example) are not detected at all. On top of all this, as a fast moving object hurtling towards the Sun, the only volatiles available to study are those located in the comet's coma - the cloud of gas surrounding the solid ‘nucleus’ of a comet. The composition of the coma is assumed to be different from that of the nucleus because the volatile elements vapourize more quickly, so the coma is expected to have more of them and may not reveal some non-volatile elements present in the nucleus. As the relationship between the chemicals observed in the coma and those contained in the nucleus is unknown, abundances in the protoplanetary disk that seeded our solar system cannot be accurately inferred either. 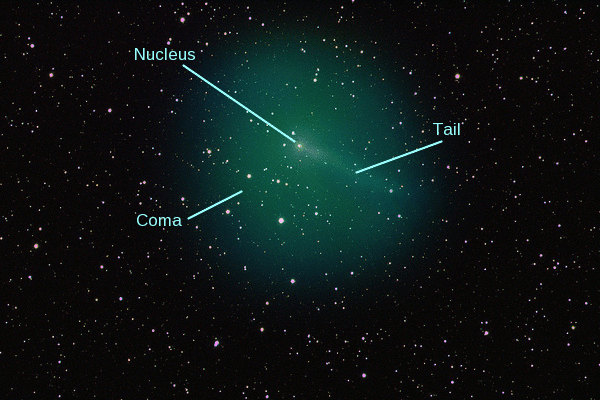 Annotated photograph of Comet Hartley 2, showing the solid nucleus in the centre, the gaseous coma surrounding it, and a faint tail. Comet 103P Hartley was once described as a weird little comet by NASA, due to its high levels of activity. Photograph ©Nick Howes, used with permission. All rights reserved. At present, knowledge of a comet's interior is limited mostly to theoretical models. Models suggest that comets are composed of a non-volatile component, usually referred to as dust, and a volatile one consisting of ice. To date, only two comets have been comparatively well studied; Halley's comet from its 1986 sojourn around the solar system and comet Tempel 1. 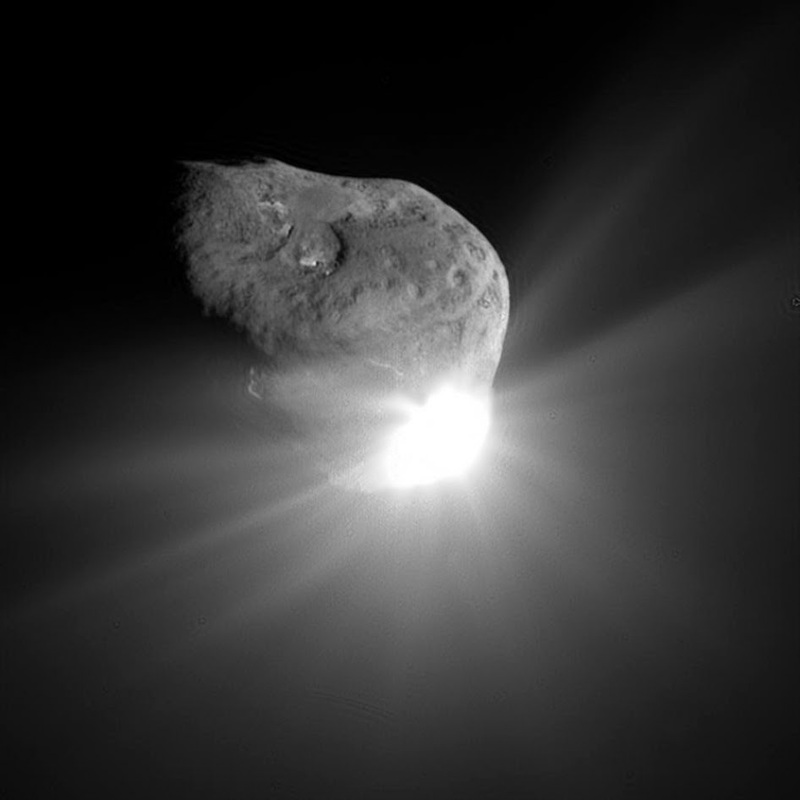 Comet Tempel-1 was the main focus of the successful NASA Deep Impact mission which provided the first opportunity to look inside a comet. Launched in 2005, Deep Impact was designed to determine the comet’s structure and chemical composition by “bombing” it with a high velocity impactor, and a “flyby” probe that looked at the resulting ejecta and crater. Studies confirmed that a surprising amount of dust was present at the impact zone, more so than ice, with some scientists suggesting that the fine dust material must be tens of meters deep on the comet surface. Analysis of the dust plume ejected by the impact event showed that the material contained small silicate grains, simple organic molecules, polycyclic aromatic hydrocarbons (PAHs) and water ice. Despite the success of the impact, little was learned about the structure of the comet's nucleus. So, what does lie in the middle of a comet? How differentiated is the nucleus, if at all? Just how much of the external material is modified as the comet approaches the Sun? Luckily, we don't have to wait until Halley's comet returns to find out. Launched a year before Deep Impact, Europe’s Rosetta spacecraft is due to drop its robotic lander Philae onto comet 67P/Churyumov-Gerasimenko on Wednesday, 12 November. Philae is equipped with a number of instruments to perform in-situ analyses on the chemical, mineralogical and isotopic composition of the surface and subsurface of the comet. It will remain on the comet for over a year on its landing site (now named Agilkia), giving scientists unprecedented access to the secrets of comet chemistry. One such instrument on board the lander is the Alpha Particle X-Ray Spectrometer (APXS), a combination of two spectrometers to detect alpha particles and x-rays. A spectrometer measures the properties, such as the intensity, of electromagnetic radiation like light or x-rays, at specific wavelength intervals. APXS will provide information on the elements that make up the comet's surface by bombarding it with a radiation. The alpha spectrometer can detect relatively light elements such as carbon and oxygen, while the x-ray detector will detect heavier ones, from sodium through to nickel and beyond. The various element ratios recorded by the spectrometer will be used to determine where the comet was originally formed by comparing them with known meteorite types. The elements will have condensed according to their level of volatility; a large concentration of a certain element can therefore place constraints on the comet’s formation. The relative abundance of different elements in the comet will be a useful tool to interpret the chemical and physical processes that occurred during the evolution of the solar system. Other instruments helping to catalogue the expected glut of elements, isotopes, and compounds that make up the comet are COSAC (Cometary Sampling and Composition experiment) and Ptolemy. COSAC is a gas analyser designed to identify, characterise and quantify volatile cometary compounds, with an emphasis on complex organic molecules. This includes a subset of large molecules known as chiral molecules. Chiral molecules are important for life, and one hypothesis for explaining how the molecular precursors of life may have formed on an early Earth is through transportation of huge amounts of organic matter via comets. If a deviation from the organic compounds observed in biotic matter on Earth were found, this could add weight to life being seeded on Earth from interstellar origins. The topic is highly debated, therefore the identification (or absence) of certain chiral molecules in cometary material is of much interest to scientists. Ptolemy is similar in principle to COSAC, but will focus on accurate measurements of light elements including carbon, nitrogen and oxygen and will provide analytic data on noble gases, carbon monoxide and water. In addition to analysing solid samples, Ptolemy can passively adsorb the comet’s coma material for later processing and analysis. 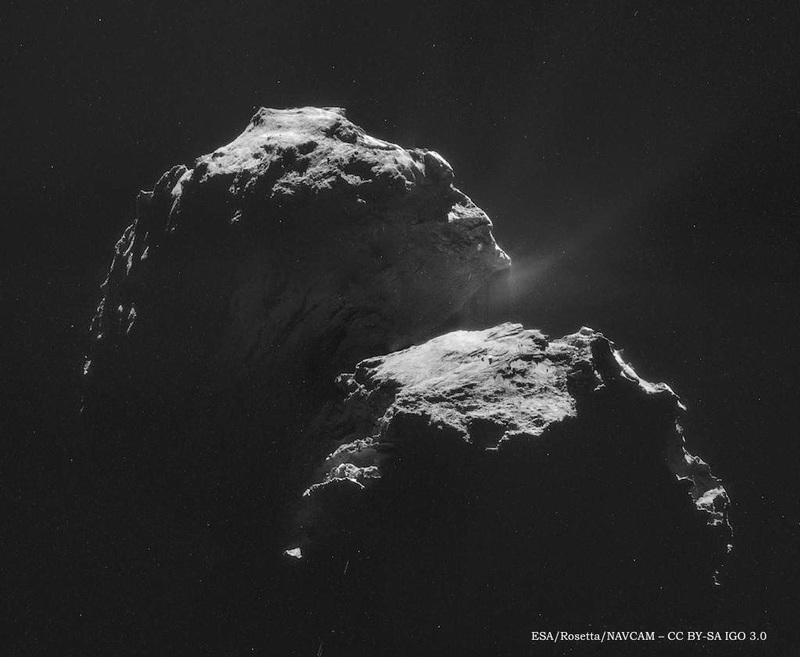 Landing a robotic laboratory onto a comet is an incredible achievement in itself. If Philae successfully completes its objective, the knowledge gained from such a technically audacious mission will be equally groundbreaking (so to speak). The uniqueness of Philae will overcome the limitations faced by astronomers who rely on analysing spectra. 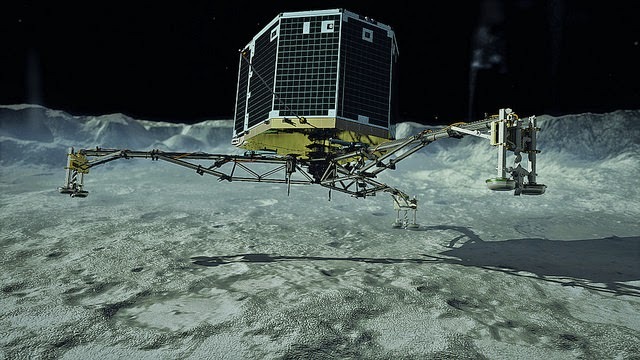 Philae can also evaluate how the comet's chemistry is modified as it approaches the Sun, until it either overheats, gets blown off the surface by cometary activity, or enough dust accumulates on its solar panels to prevent it from operating. It would appear then, that Philae has a lot to live up to. This guest post was written by Dr Kerry Hebden, a freelance science writer with a PhD in Astronomy and a BSc in Earth and Planetary Science. Kerry’s particular interests lie in the domain of astrochemistry. Kerry writes for a number of astronomy magazines and websites, including her blog Impossible Planet, and can be found on twitter as @CosmicMagpie. why don't all references have links? Berlin, DLR. 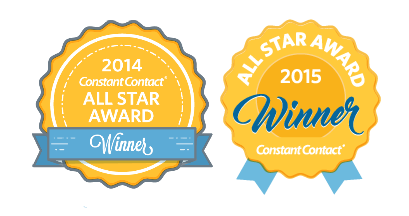 "Modeling the structure and activity of comet nuclei." Comets II (2004): 359. Kadono, T et al. "The thickness and formation age of the surface layer on comet 9P/Tempel 1." The Astrophysical Journal Letters 661.1 (2007): L89. Mumma, Michael J et al. "Parent volatiles in comet 9P/Tempel 1: Before and after impact." Science 310.5746 (2005): 270-274. Klingelhöfer, G et al. "The Rosetta alpha particle X-ray spectrometer (APXS)." Space science reviews 128.1-4 (2007): 383-396. Andrews, Dan; Barber, Simeon; Morse, Andrew; Sheridan, Simon; Wright, Ian and Morgan, Geraint (2006). Ptolemy: An instrument aboard the Rosetta lander Philae, to unlock the secrets of the solar system. In: 37th Lunar and Planetary Science Conference , 13-17 March 2006, Houston, Texas, USA. This work by TWDK is licensed under a Creative Commons Attribution-ShareAlike 3.0 Unported License.. Powered by Blogger.